Ottawa, October 31, 2005 — Canada’s northern Boreal woodlands, comparable to the Amazon in terms of their natural wealth and ecological importance, are under threat, the National Round Table on the Environment and the Economy (NRTEE) has concluded in a new report released today. The vast Boreal region stretching across the north in seven provinces and all three territories contains the last natural, original forests remaining in the world. It comprises 6 million square kilometres and contains as many as 2 million lakes. The new NRTEE State of the Debate report warns that this precious resource has been affected seriously in recent decades by logging, mining and energy extraction and global warming. Planned, measured, sustainable development of the Boreal is essential to enable these crucial economic activities to thrive while protecting the equally crucial natural environment. conservation easements (permitting third parties to negotiate directly for the right to manage Crown land in the interests of preserving vital biodiversity outputs , such as clean air, water, etc). For example, under a market-based system, developers could buy, sell or trade development rights, with the prospect of financial compensation for preserving land from exploitation. 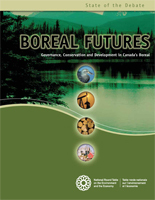 Such market-based instruments could ease the strain of development in the boreal region across Canada, if they are used either as stand-alone measures or in creative combinations, the report suggests. The NRTEE, an independent federal agency, is dedicated to exploring new opportunities to integrate environmental conservation and economic development, in order to sustain Canada’s prosperity and secure its future.